Are you looking for the perfect holiday gift for the loved ones in your life? Look no further. We are putting together some of our favorite gifts for Mom, Dad, Grandparents, and kids. Our mind set to gifts might be a little different then most, as we believe that gifts should be minimal, but still impact the person they are given too. We are going to keep our gifts under $25. Don’t forget to sign up for Ebates before you begin your online shopping. Receive cash back on almost all your purchases from 1%-10%(Offers change daily). Sign up using this link and you will get $10 cash back on your purchase of $25 or more. I will also receive a bonus for you using my referral link. These always seem to be the hardest gifts to pick. What do you give the person who does so much for you? One thing we recommend is staying away from gifts that mom would use for cleaning, cookings, doing laundry etc. You want mom to have a gift that she can enjoy and love for many years to come. Our favorite gifts of course are gift certificates for a new hair do, or a mani/pedi. But if your looking for something more personal, here are a few things we love. The gift of sleep- Get mom the Luxury Lush Pud bath bomb by Lush Cosmetics and send her up for a relaxing bubble bath and an early bed time. Have dad take care of the kiddo, or send them for a sleep over. Mom will love catching up on some sleep. 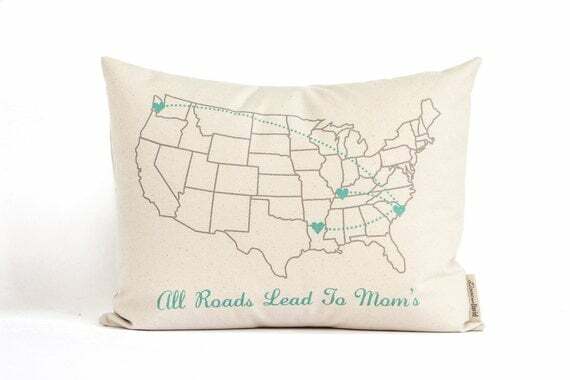 All Roads Lead back to Mom- This beautiful throw pillow could be a combined gift with you and your siblings. Perfect for those who live far away from mom, but want to show they are always close at heart. You’re a Cool Mom- These adorable candles! Personalize your own scent and message to mom. We all know they are always trying to cover the sent the kids leave behind. Personal- Or just create something personal for mom, some art work, paint a coffee mug, something special she would like. I always give out personalized gifts made by Chief for the holidays. This is an area I never had any problems with. My dad is a lover of all things Home Depot. I am pretty sure that this is exactly where my love for Home Depot comes from. We spent many weekends picking up things for a project he was working on. So every year he gets a Home Depot gift card from us. 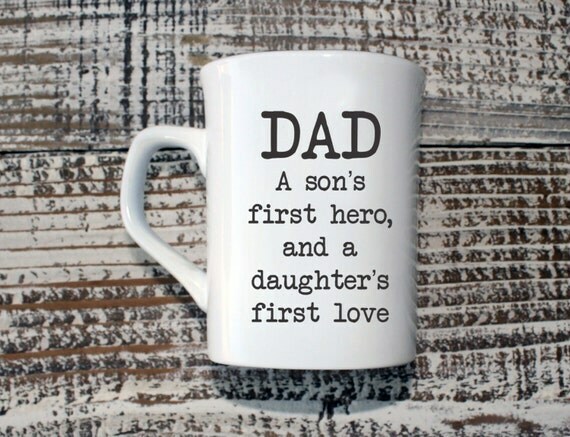 The Traditional Coffee Mug- This dad coffee mug is a staple of the past. I remember giving them to my dad growing up and he still uses them to this day. Reusable Cup- If dad is more into a reusable coffee cup then this Tervis Tumbler is right up his alley. With the lifetime warranty, its perfect for those with little kids who knock things over. The trusty gift card- I go this route every Christmas for my dad because I never know what he wants, but know he needs something from Home Depot. Something to Carry Around- This awesome Guitar pickKey Chain is perfect for Dad, and will always remind him how much you are grateful for him. Here is where I tend to differ from most parents. I love to give gifts that last and are educational. I tend to give Melissa and Doug items, arts and crafts, or outdoor toys. I base each gift on the child, age and their current likes and dislikes. In my opinion that when you buy gifts that are current fads or are really popular, you are spending a lot of money as these are typically not very cheap. When buying items that are educational or made to last, the children will get much more use out of them. A bigger plus is getting them toys for outdoor play, as these are not given very often and it helps promote getting outside. Here are some of my favorite items to give as gifts for kids. Locks and Latches board by Melissa and Doug. Perfect for toddlers. Puzzles by Melissa and Doug. Tuns to choose from, from Chunky pieces for the littles to large floor puzzles for older children. Arts and Crafts by Melissa and Doug. We love the shape, model & mold play clay kit. Melissa and Doug have a great assortment of games. They are small enough to fold up and take with you to the park, camping, or just out back in your own yard. If you have a reader to buy for then I highly recommend Usborne books. We LOVE the shine a light series. So much fun. In the end, Christmas isn’t about the gifts. It is about spending time with your family, coming together to celebrate. Don’t stress about finding the perfect most expensive gift for your children, niece, nephew, mom, dad, etc. I have found that the most meaningful gifts come from the heart. If you can not find the “perfect” gift to give then that’s fine. No one will look back on Christmas day and say man my mom gave crummy gifts, or wow my daughter didn’t give me what I wanted. Well maybe younger kids may think this, but its our job as parents to teach them to be grateful for anything and everything they may receive. What are you favorite gifts to gift? Let us know in the comments. I wish you all a Very Merry Christmas! Happy Shopping! ← Is Your Car Seat Installed Properly?